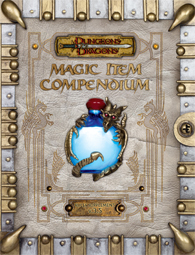 Wizards of the Coast has released a premium reprint of the ultimate magic item trove for D&D players: the 3.5 edition Magic Item Compendium. My favorite section in the compendium was, without a doubt, Item Sets. But maybe that’s just the Diablo player in me talking. A magic item set consists of three to six thematically linked magic items that provide extra bonuses or effects when worn together. The abilities scale or accumulate with the number of items worn, and a character gains a particularly potent effect when all the items of a set are worn or used together. The reprint will be available at retail for $49.95. For more information and excerpts, visit the official webpage.